I've heard that the Polk building was once used as a car dealership, and it has strong supports to hold up cars, and even a car elevator. It would be very cool if they could keep it as the actual parking deck structure. I'm sure they won't, but still an interesting idea. The state let the building go to pot. It would cost more to fix the building than to build a new one. All the brick on the out side would have to be removed and the inside is in bad shape and has to be complying rebuilt. yeah it was poorly renovated in the early 80's. It is a sound building though as it used to be an auto dealership. they actually stored cars on the upper levels if Im correct. So if the structure is strong enough for the cars, then take off the facade which is clearly too far gone, and make it the parking deck for the new project. I don't see how this structure, strong enough to be filled with cars for a dealership, couldn't work for a parking deck. My wife asked about this building yesterday and I told her it was being torn down. She said 'why, it looks like a nice old building?'. That got me thinking, and I wanted to find some pictures of what it looked like before it went into disrepair. Here is an old picture from when it was built, showing its context at the time. To me, this building was and is worth saving. Charlotte does not have many pre-Depression buildings left, and especially not downtown. It is a major shame to just tear it down. They could easily just keep it as the parking deck as I mentioned earlier. I like the project that is going there, based on the latest renderings. But it just a shame that in Charlotte, and 80 year old building still standing is just well-organized rubble. He was apparently a distributer of Buicks, which is (as I understand it) an original use of Polk building. ^ nice find! i agree they should bake this into the new project (which, btw - is great). one of my favorite things in architecture is when something old is utilized with something modern... when done right - it is my greatest of design pleasures. Wouldn't it be great if car dealers today stored all their vehicles in buildings like that nowadays in stead of the massive gawdy parking lots they use? We found that by gutting our building (Cedar Hill also built 1925) that it was actually easier to rent than to build up the inside and then rent. Prospective tenants love seeing the old way they poured the concrete and the interesting window sills, etc. FWIW, we had a hard time deciding between residential and commercial. I still wish we had gone residential, but that's just me. There were several decision makers. Please call up Trinity, then, windsurfer and tell them how it is done! I wish I had that kind of influence, but I guess I could say we had prospective tenants who wanted more space than what we had available (which is true). Then again, this post is creeping up what's allowed on this forum. It's funny how much money we'll spend re-creating warehouse-type lofts when true warehouses go wasted. Density would be the reason, the car dealership only had a very few cars, and only on a couple of levels as i remember. Having this building torn down only reinforces Charlotte's stereotype as a city lacking tangible traces of its history, and sad to say, to a certain extent it is true. The problem is that only small parts of the building are really "worth saving" (to use that tired old saw). There are a couple of elements of the facade and molding which stand out, but the rest of it is a big brick box -- and a badly-maintained one at that. At most I would hope to see the building's unique elements saved and worked into the facade of a newer, more stable building. The rest of it really is just bricks, after all. It's not historically important, no matter how much we sentimentalize it. Many historic or very old buildings in Europe have been practically rebuilt over time. But they are still old. The problem here is that we think that if the original parts have gotten old, then the whole damn things needs to go to the dump. Just take a look through cmstory.org's old pictures and you see how many unbelieveable buildings and homes have been carted off to the dump. So the cement crumbled after 80 years, including many owned by the state of North Carolina (which has barely heard of Charlotte), where almost no maintenance was done. So, um, put some brown bricks up with new cement, and voila, you have restored the 1925 C.C. Coddington Building. Is the structure falling down? That was the old standard for an old building to be beyond salvation. Now, it is just assumed that old buildings will be removed, so we do. In the last few years, we lost the old brick warehouse across Graham Street for a parking lot, we have lost the old brick building that housed the Presto Grill, we have lost the turn of the century brick store fronts for new store fronts that sit empty in the arena, the old Dupont building, we have lost the 1920s headquarters of Duke Power, not to mention all the teardowns of old homes in Dilworth and Myers Park. We are about to lose the Coddington Building, the Hall House, Virginia Paper Building, the old Sears building, the Coffee Cup, the pre-WWI house on Liz Ave [i mentioned in that thread], possibly the Belk Mansion, probably the Treloar and every other old building in Levineland. History and progress should be complimentary, not contradictory. Charlotte's history is then AND now. If you simply confine it to one particular era, then you'll see practically nothing remaining from the present 100 years from now, and that would truly be a shame. Is the structure falling down? That was the old standard for an old building to be beyond salvation. Now, it is just assumed that old buildings will be removed, so we do. I thought the building had been condemned (or at least abandoned) due to structural problems? No. It was abandonned by the state for use as offices due to the sale of the property. It certainly would require some renovations, such as fixing the deadly falling bricks, and some interior maintenance items to correct years of neglect from the very poor state of North Carolina. ^ Hmm, I must've had it confused with another building. I pass Polk every day, and I've gotten pretty used to thinking of it as a dump. If someone can renovate it back to par, they've got my complete support. But I won't be really upset about its demolition unless the entire facade is detroyed, which IMO would be a shame. From a facade perspective, all it needs is the new bricks and replacement of those more modern windows. By putting in windows that are clearer and have old-skool lines, it would closer to it originally did. Has Trinity closed on the purchase of this site yet, or has it still been delayed? It may only be utility work, but they are digging a big hole at SW quad of 5th and Graham. Any news on this thing? I hope with the demand for apartments these days that this can move forward, but given that Trinity is involved with Novare in building office on their site and the fact that the city wanted very badly to have office on this site across from the station, I hope they were able to adjust this project a bit to meet the current environment. I'm not sure, though. I sort of assumed this was a stalled project. 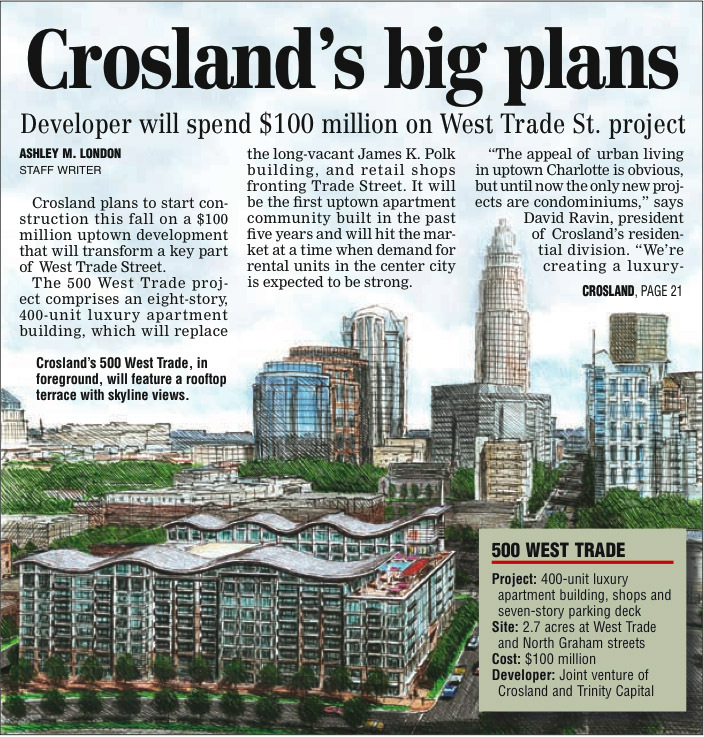 New Plans and Renderings on this project on the front page of the CBJ. The plans have become 400 rental units in a 8 story building with a 7 story deck. There will be Street level retail and a fantastic roof top terrace with two pools. While i know its not the high rises everyone was hoping for, its some good midrise infill that will help bridge the very unfortunately gap between gateway and trademark. I was beginning to wonder what was up with this project. If they're only going to build a midrise, though, I'm disappointed that they couldn't find a way to incorporate the Polk building. Sure it's been vacant for a while, and sure it needs some work, but there are plenty of examples all over the country of buildings much older and much worse off than this one being preserved. Sigh, the tradition of "out with the old, in with the new" continues apace.